Mary J. Blige blinked back tears and buried her head in her hands when she recently heard Need Someone, an emotional ballad off her new album My Life II... The Journey Continues (Act 1). The song, said Blige, is actually an ode to her younger, more troubled self. "From where you stand there's no way to change it, no way to make it make sense and it's lonely there in the spotlight," she sings over lush strings and piano. "Well honey, don't I understand you need someone to love you." Blige, 40, is revisiting — and comforting — her 23-year-old self for a reason. She recently released her 10th album, a sequel to 1994's My Life, the classic that catapulted her to R&B stardom and exposed her seemingly endless personal turmoil. Back then, she struggled to overcome a well-documented battle with drugs and alcohol, clinical depression and a tumultuous, tabloid-making relationship with K-Ci Hailey of Jodeci. "This is the Mary from My Life and the Mary today that still has challenges," Blige said, referring to herself while perched in an oversized chair in her suite at the Beverly Hills Hotel. "We all have a moment where we've slipped into darkness... and at the end of the day, like the song says, the only person who we need to love us, is us." Since being branded the "queen of hip-hop soul" some 17 years ago, Blige has delivered on the moniker. She's found crossover success in the pop world while continuing to deliver resilient R&B anthems that pair gut-wrenching lyrics with hard-knocking hip-hop beats. While the emotional tumult made for gripping music, it wreaked havoc on her personal life. 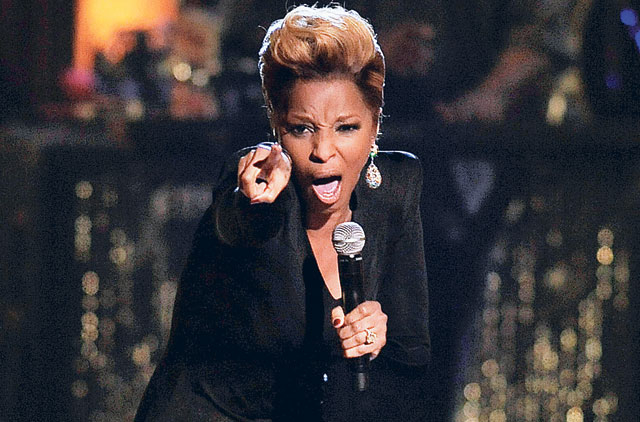 "I knew at some point I was going to die," said Blige. "I was starting to feel like I didn't want to be here. "You start to feel like you slip away, no matter how much you're on stage. You're there, but you aren't really there. I didn't want to die, but I wanted to die." After hitting bottom, she turned to her Christian faith, abstained from drugs and drinking and released No More Drama in 2001. She also found love and in 2003 married record executive Kendu Isaacs, who now manages her career. She credits him as a saving force that helped her overcome her demons. So why revisit the album that earmarked her lowest point? "I was in so much pain and I had no idea that so many people were in pain with me," said Blige, who's forged an unusually deep connection with fans. At her shows, male and female fans can still be seen weeping and chanting every word of her songs — especially the older material. "The thing that remained even after the evolution of No More Drama, Share My World, is pain. That's one of the reasons I wanted to channel this again. Things got better, they got great, but the challenges got greater." Blige isn't trying to compete with My Life II's predecessor, a move that critics and hard-core fans might deem as sacrilege. When My Life debuted in 1994, it was a public cry for help. Produced by rap kingpin and mentor Sean "Diddy" Combs and peppered with samples of Curtis Mayfield, Roy Ayers, Teddy Pendergrass, Marvin Gaye and Rick James, Blige's raw, heartbreaking vocals stood out among her more subdued R&B peers. She begged, she cried and she hurt — but most of all, she hit a personal chord with listeners. As a result, My Life was named the most successful R&B album on Billboard's year-end chart in 1995. Time and Rolling Stone named the disc among their best albums of all time lists. Blige admits she initially didn't want to look back at that painful time, and when asked if she realised how deeply the disc would touch others, she shakes her head in disbelief. "I was so messed up," she said. "I needed it to help me. I really needed to be happy. I wasn't thinking it would end up as an anthem. It was very self-centred for a reason. Maybe because I was in so much pain." Combs, however, knew Blige would connect. "When we made My Life, I knew Mary's heart was pouring out in such an honest way, people had to respect what she was giving them," he wrote in an e-mail. "Musically, the vibe we had was on point for the culture. Mary was every girl, Mary was your sister, your ex-girlfriend, the girl you loved. She connected in a real way; I knew there was magic in that, there was magic in the pain." In recent years Blige has caught flak for not returning to the depths of despair that characterised her earlier works. Though Blige has enjoyed fairly positive reviews with each new CD, online reviews by fans show a growing dissatisfaction with Mary's healthier, happier self. "Ever since Mary has been happy her music has been lame," wrote one former fan on the Amazon website. "I enjoy her older albums when she was mad and going through things... I wish she would get divorced so she can start making good music again." Blige is visibly uncomfortable with the barbs from disgruntled listeners. "First I was hurt," she said. "There's a lot of areas in my life that I'm stuck in, so I can't get angry at them for saying, ‘We love you Mary, but we're kinda miserable still.' I was a little hurt but I understood — they haven't moved. So many people were angry that I changed [but] so many people stayed with me." On her new album, tracks such as No Condition and the Drake-assisted Mr Wrong show a wiser Blige in much more control of her aching. My Life II isn't a Blige/Combs affair like its predecessor. But the album conjures the same new jack swing she ushered in on her debut, What's the 411?, albeit with an updated groove courtesy of a younger generation of hip-hop beatmakers such as Rico Love, and Eric Hudson. Combs, Beyonce, Nas, Busta Rhymes and Rick Ross also appear on the disc. Blige celebrated both My Life albums with a string of intimate engagements where she performed My Life in its entirety. During her show at Club Nokia, she was upbeat when she sang new material and revealed plenty of tears as she performed old My Life cuts. "These songs, they break me down," she emotionally told the crowd. "They make me want to fall down and think." The singer wants the album to show that despite everything — the accolades, the Grammys, the challenges — finding and accepting herself is what keeps her going. "We are strong and we can do anything. We've learned to love ourselves even through trials and darkness. That's the only way to continue this journey," she says. "There are still going to be trials and Mr Wrongs and moments like No Condition and Empty Prayers. But the bottom line is, we need to love ourselves. That's it."